Saturday 31st May 2014 was a very special day for buses in the Cheltenham and Gloucester area. Bus company Stagecoach West put on a superb running day to celebrate 85 years of the Cheltenham District Traction Company and to mark the retirement of it’s “bus enthusiast” Managing Director, Ian Manning. Our cameras were on hand to record the event for all to see. There were over twenty five ‘heritage’ vehicles operating alongside the normal allocation of buses for the day. These ranged from Bristol Lodekkas, MWs and REs, a Daimler CVG, Guy Arab, Leyland Royal Tiger as well as AEC Routemasters and AEC Regents, of which two of them were once operated by the Carris company of Portugal, both left hand drive! Vehicles previously operated by Bristol Omnibus, East Kent, Eastern Counties, London Transport, Clydeside Scottish, Thamesdown and Alexander Midland were amongst those operating the heritage services. Filming starts at the beginning of the day in Cheltenham. Centring on Royal Well Road and the Promenade, we see the buses arriving and setting off into service for the day. We have included the current Stagecoach vehicles and local operators in this programme to offer a comparison with the heritage buses and coaches. There is plenty of action for you to enjoy. Our first ride of the day is on board preserved, former Carris, Portugal AEC Regent III of 1954, 255 (GB-21-07) on the free service to Cheltenham Racecourse (GWR Station). It is fascinating to ride on the ‘mirror image’ Regent, sounding like a London Transport RT but with driver and stairs on the ‘wrong side’! We return to the Promenade on former Carris AEC Regent V of 1961, 426 (HH-97-96), again sampling the sights and sounds of this remarkable bus. This is probably the only time that these vehicles will run on UK roads carrying passengers. Filming continues on this busy Saturday morning in Cheltenham on Royal Well Road and the Promenade. 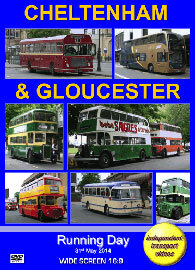 Our next ride is to Gloucester on board former Bristol Omnibus Bristol LD, L8515 (969 EHW). This type of bus would have been a regular on this route in the 1950s and 1960s. Once at Gloucester we film the action in and out of the bus station and on Market Parade. There is plenty going on with the regular Stagecoach services intermingled with our heritage buses offering a great variety for the enthusiast and the general public who were genuinely fascinated by the visiting buses! Our return to Cheltenham is done in style, on board preserved 1952 Leyland Royal Tiger, PC1 (BMS 222) in the cream and blue colours of Alexander Midland. This beautifully restored coach offers a comfortable ride back to the action on the Promenade in Cheltenham. With more action recorded on Royal Well Street and Clarence Street where we see Bristol RELL6L, 1000 (KHW 306E), the first service bus RE operated by Bristol Omnibus, turned out in the smart dark red and cream livery of Cheltenham District. Final scenes are shot on the Promenade at the end of this very special day.